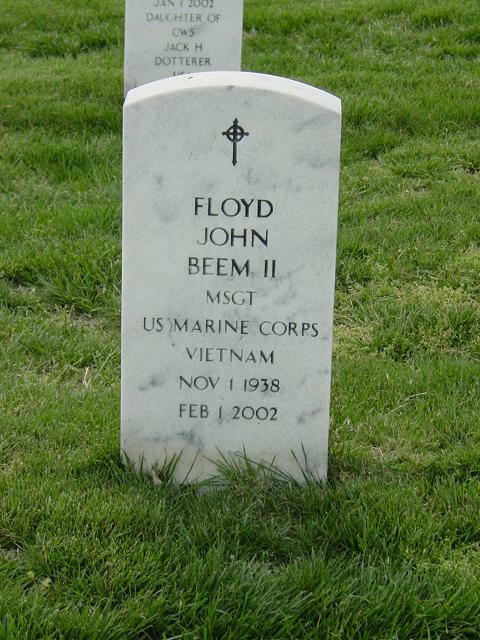 On Friday, February 1, 2002, we lost our father, Floyd John Beem III, Known to his friends as "Jim" and his family as "Sonny," after a difficult battle with cancer. He lived in the Washington, D.C. area for the last 30 years, raising his three sons in Woodbridge, Virginia and living more recently in Arlington, Virginia. Jim was born November 1, 1938, near Richmond, Virginia, and was adopted by Floyd and Birdie Beem. He was raised in Norfolk, Virginia, with three adopted siblings and several foster children in a very loving and disciplined home. At age 17, he left home to fulfill a childhood dream by becoming a Marine. He was an incredibly patriotic and loyal man, and the "Corps" was a perfect fit for him. He served proudly for 22 years including two tours in Vietnam and was honored to start his second career as a U.S. Capitol Police Officer only days after retiring from the Marine Corps. A proud American, he loved the Capitol building and enjoyed protecting and representing one of our country's most treasured sites. He truly enjoyed his work and became legendary for his animated tours of the Capitol and his antics, such as his favorite John Wayne impersonation (which impressed Mr. Wayne's son, Michael on a visit to Washington, D.C.). He received many personal letters of thanks from tourists across the U.S. and abroad who remembered him as a highlight of their vacations, and he often received personal thanks from members of Congress and Senators for providing information and memorable tours to their constituents. More recently, Jim continued to serve his country through his work as a recruiter with Intercon Security, which provides security officers to the State Department and as office manager at Radian Incorporated, which supplies security systems to buildings around the world, including the Pentagon. Jim loved to sing and dance and lived life to the fullest. He performed regularly at local piano lounges and, with his sense of humor and unique style, he headlined showcase events in clubs and restaurants in the area. His repertoire included classic songs by Sinatra, Como, and Mathis, and he could ofter be heard crooning tunes in Capitol corridors during the early morning hours. He carried a picture in his wallet and would ask anyone he met, "Do you want to see a picutre of my pride and joy?" When he displayed a picture of Pride furniture polish and Joy dishwashing detergent, laughter began and friendships were born. Though the Pride and Joy picture was one of his noted antics, he derived his real pride from his three sons, their wives, his grandchildren and from proudly serving his country through his careers as a Marine and a Capitol Police Officer. His joy was from loving his family and his partner, Judi, and sharing with them all laughs, humor, song and dance; putting a smile on everyone's face; making a stranger laugh and nurturing the many friendships he made on his journey through life. The family wished to express their thanks to his many dear friends who have been so supportive over the last few months while he fought his illness. The calls, cards and visits will not be forgotten. Special thanks to his wonderfully loving partner, Judi, who filled the last years of his life with a special love and happiness. Her support was unwavering and her effort tireless. Dad, rest in peace. We love you. Funeral services will be held at Vienna Presbyterian Church, 124 Park St., N.E. Vienna, Virginia, on Monday, February 11, at 1 p.m. Interment Arlington National Cemetery.